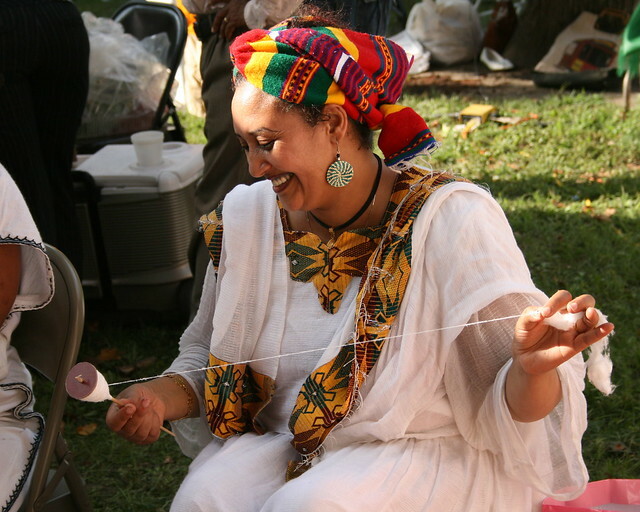 Women's traditional clothes in Ethiopia are made from cloth called shemma and used to make habesha qemis: it is basically cotton cloth, about 90 cm wide, woven in long strips which are then sewn together. Sometimes shiny threads are woven into the fabric for an elegant effect. It takes about two to three weeks to make enough cloth for one dress. The bottom of the garment or shirt may be ornamented with patterns. Men wear pants and a knee-length shirt with a white collar, and perhaps a sweater. Men often wear knee-high socks, while women might not wear socks at all. Men as well as women wear shawls, the netela. The shawls are worn in a different style for different occasions. When going to church, women cover their hair with them and pull the upper ends of the shawl about their shoulders reproducing a cross (meskelya), with the shiny threads appearing at the edge. During funerals, the shawl is worn so the shiny threads appear at the bottom (madegdeg). 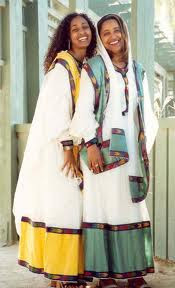 Women's dresses are called habesha qemis. The dresses are usually white with some color above the lower hem. Bracelets and necklaces of silver or gold are worn on arms and feet to complete the look. A variety of designer dinner dresses combining traditional fabric with modern style are now worn by some ladies in the cities. Often, a woman will cover her head with a shash, a cloth that is tied at the neck. Shama and kuta, gauze-like white fabrics, are often used. This is common among both Muslim and Christian women. Elderly women will wear a sash on a day-to-day basis, while other women only wear a sash also called a netela while attending church. Ethiopian weddings follow both traditional and modern rituals. Family is a large part of wedding preparations and ceremonies on the special day. Attire is similar to that of the US, with men in either tuxedos or suits and the bride wearing a white wedding gown. Rituals vary slightly between subcultures. Oromo people make preparations for the wedding for a month before the occasion. On the couple's wedding day, relatives and guests will assemble at the bride's and groom's houses. The groom dresses for the wedding and is blessed by his relatives. He then picks up the bride from her house. The bride and groom meet at the entrance of her house amongst beating drums. Amongst the Amhara people, the bride and groom's families are responsible for arranging marriages. A civil ceremony solidifies the contract and a priest may or may not be present. An oral contract or "temporary marriage" is made before witnesses. The woman will be paid housekeeper's wages during the marriage. While the wife is not eligible for inheritance, the couple's children are. While divorce is allowed in Amhara marriages, it must be negotiated first. Ethiopia is truly a land of beautiful secretive mysterious and extraordinary.A country of great antiquity with a culture and traditions dating back more than 3,000 years.Like many other African countries it is a multi-ethnic state,many distinctions have been blurred by intermarriage over the years but many also remain. Most people wear traditional cloth locally called "Yehager Lebese" which means national cloth.These clothes are mainly made from cotton that is woven together in long strips and then sewn together to make cloth and with Shinny threads and lots of pattern to decorate the cloth makes it elegant and eye catching. The traditional clothes are mostly made by "Shemmanes" the name for dress weavers for the locals for different occasions,the Shemmanes and other designers venturing into the traditional clothes are improving the design and quality of the clothes to meet the changing needs and tastes of the consumers making the demand of the traditional clothes to increase both locally and overseas from the diaspora. With a range of traditional costumes the communities are proud of there jewellery,hair style and the embroided dresses.The women wear dozens of plaits "Sheruba" which is usually tightly braided on the head billowing down the shoulders while others depending from their tribes roots have part of their hair in the middle making a bun behind each ear.Necklaces and bracelet's are worn around the arm and feet made from silver and gold.